Let’s look at one truth at a time. The First Noble Truth often is translated as “Life is suffering.” Many people new to Buddhism tune out as soon as they hear this. But the Pali word dukkha also refers to anything that is temporary, conditional, or compounded of other things. Even something precious and enjoyable is dukkha, because it will end. Related to the nature of life is the nature of self. Are we not also temporary, conditional and compounded of many parts? We can understand that life is impermanent but are we, also, impermanent? The Buddha taught that before we can understand life and death we must understand the self. The Second Noble Truth teaches that the cause of suffering is craving or thirst (tanha). We continually search for something outside ourselves to make us happy. But no matter how successful we are, we never remain satisfied. The Buddha taught that this thirst grows from ignorance of the self. We go through life grabbing one thing after another to get a sense of security about ourselves. We attach not only to physical things, but also to ideas and opinions about ourselves and the world around us. Then we grow frustrated when the world doesn’t behave the way we think it should and our lives don’t conform to our expectations. The Buddha’s teachings on karma and rebirth are closely related to the Second Noble Truth. The Buddha’s teachings on the Four Noble Truths are sometimes compared to a physician diagnosing an illness and prescribing a treatment. The first truth tells us what the illness is, and the second truth tells us what causes the illness. The Third Noble Truth holds out hope for a cure. The Buddha taught that through diligent practice, we can put an end to craving. Ending the hamster-wheel chase after satisfaction is enlightenment (bodhi, “awakened”). The enlightened being exists in a state called Nirvana. In the Fourth Noble Truth, the Buddha as physician prescribes the treatment for our illness: The Eightfold Path. Unlike in many other religions, in Buddhism there is no particular benefit to merely believing in a doctrine. Instead, the emphasis is on living the doctrine and walking the path. The Eightfold Path of Buddhism is the means by which enlightenment may be realized. 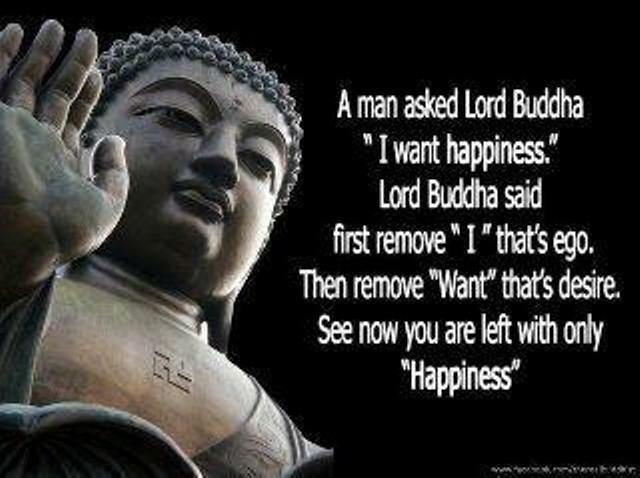 The historical Buddha first explained the Eightfold Path in his first sermon after his enlightenment. Most of the Buddha’s teachings deal with some part of the Path.You might think of it as an outline that pulls all the Buddha’s teachings together. 1 Right View or Right Understanding, insight into the true nature of reality. 2 Right Intention, the unselfish desire to realize enlightenment. 3 Right Speech, using speech compassionately. 4 Right Action, ethical conduct; manifesting compassion. 5 Right Livelihood, making a living through ethical and non-harmful means. 6 Right Effort, cultivating wholesome qualities; releasing unwholesome qualities. 7 Right Mindfulness, whole body-and-mind awareness. 8 Right Concentration, meditation or some other dedicated, concentrated practice. tataḥ—thereafter; kalau—the age of Kali; sampravṛtte—having ensued; sammohāya—for the purpose of deluding; sura—the theists; dviṣām—those who are envious; buddhaḥ—Lord Buddha; nāmnā—of the name; añjana-sutaḥ—the son of Añjana; kīkaṭeṣu—in the province of Gayā (Bihar); bhaviṣyati—will take place. Then, in the beginning of Kali-yuga, the Lord will appear as Lord Buddha, the son of Añjana, in the province of Gayā, just for the purpose of deluding those who are envious of the faithful theist. Killing of animals before the advent of Lord Buddha was the most prominent feature of the society. People claimed that these were Vedic sacrifices. When the Vedas are not accepted through the authoritative disciplic succession, the casual readers of the Vedas are misled by the flowery language of that system of knowledge. In the Bhagavad-gītā a comment has been made on such foolish scholars (avipaścitaḥ). The foolish scholars of Vedic literature who do not care to receive the transcendental message through the transcendental realized sources of disciplic succession are sure to be bewildered. To them, the ritualistic ceremonies are considered to be all in all. They have no depth of knowledge. According to the Bhagavad-gītā (15.15), vedaiś ca sarvair aham eva vedyaḥ: the whole system of the Vedas is to lead one gradually to the path of the Supreme Lord. The whole theme of Vedic literature is to know the Supreme Lord, the individual soul, the cosmic situation and the relation between all these items. When the relation is known, the relative function begins, and as a result of such a function the ultimate goal of life or going back to Godhead takes place in the easiest manner. Unfortunately, unauthorized scholars of the Vedas become captivated by the purificatory ceremonies only, and natural progress is thereby checked. To such bewildered persons of atheistic propensity, Lord Buddha is the emblem of theism. He therefore first of all wanted to check the habit of animal killing. The animal killers are dangerous elements on the path going back to Godhead. There are two types of animal killers. The soul is also sometimes called the “animal” or the living being. Therefore, both the slaughterer of animals and those who have lost their identity of soul are animal killers. Mahārāja Parīkṣit said that only the animal killer cannot relish the transcendental message of the Supreme Lord. Therefore if people are to be educated to the path of Godhead, they must be taught first and foremost to stop the process of animal killing as above mentioned. It is nonsensical to say that animal killing has nothing to do with spiritual realization. By this dangerous theory many so-called sannyāsīs have sprung up by the grace of Kali-yuga who preach animal killing under the garb of the Vedas. The subject matter has already been discussed in the conversation between Lord Caitanya and Maulana Chand Kazi Shaheb. The animal sacrifice as stated in the Vedas is different from the unrestricted animal killing in the slaughterhouse. Because the asuras or the so-called scholars of Vedic literatures put forward the evidence of animal killing in the Vedas, Lord Buddha superficially denied the authority of the Vedas. This rejection of the Vedas by Lord Buddha was adopted in order to save people from the vice of animal killing as well as to save the poor animals from the slaughtering process of their big brothers who clamor for universal brotherhood, peace, justice and equity. There is no justice when there is animal killing. Lord Buddha wanted to stop it completely, and therefore his cult of ahiṁsā was propagated not only in India but also outside the country. Technically Lord Buddha’s philosophy is called atheistic because there is no acceptance of the Supreme Lord and because that system of philosophy denied the authority of the Vedas. But that is an act of camouflage by the Lord. Lord Buddha is the incarnation of Godhead. As such, he is the original propounder of Vedic knowledge. He therefore cannot reject Vedic philosophy. But he rejected it outwardly because the sura-dviṣa, or the demons who are always envious of the devotees of Godhead, try to support cow killing or animal killing from the pages of the Vedas, and this is now being done by the modernized sannyāsīs. Lord Buddha had to reject the authority of the Vedas altogether. This is simply technical, and had it not been so he would not have been so accepted as the incarnation of Godhead. Nor would he have been worshiped in the transcendental songs of the poet Jayadeva, who is a Vaiṣṇava ācārya. Lord Buddha preached the preliminary principles of the Vedas in a manner suitable for the time being (and so also did Śaṅkarācārya) to establish the authority of the Vedas. Therefore both Lord Buddha and Ācārya Śaṅkara paved the path of theism, and Vaiṣṇava ācāryas, specifically Lord Śrī Caitanya Mahāprabhu, led the people on the path towards a realization of going back to Godhead. Śrīmad-Bhāgavatam was composed just prior to the beginning of the age of Kali (about five thousand years ago), and Lord Buddha appeared about twenty-six hundred years ago. Therefore in the Śrīmad-Bhāgavatam Lord Buddha is foretold. Such is the authority of this clear scripture. There are many such prophecies, and they are being fulfilled one after another. They will indicate the positive standing of Śrīmad-Bhāgavatam, which is without trace of mistake, illusion, cheating and imperfection, which are the four flaws of all conditioned souls. The liberated souls are above these flaws; therefore they can see and foretell things which are to take place on distant future dates.